Winters are gone & summers are approaching us. Harsh sun cause the problem of dry skin & chapped lips. We need to take good care of our skin to get rid of these issues. For dry skin, we can apply any moisturizer & can avoid the problems but for chapped lips, we need to be bit extra careful as the skin at lips is far more sensitive than the body. The product we choose for chapped lips should be something which keeps it moisturized without harming at all. So the best product would be something which is natural. I have a product which is a beautiful mix of all things natural & completely free from chemicals & petroleum jelly. The Product is Luscious Lip Balm Sugared Rose Petal, from the house of Forest Essentials. Ayurvedic name of this wonderful product is Taruni. 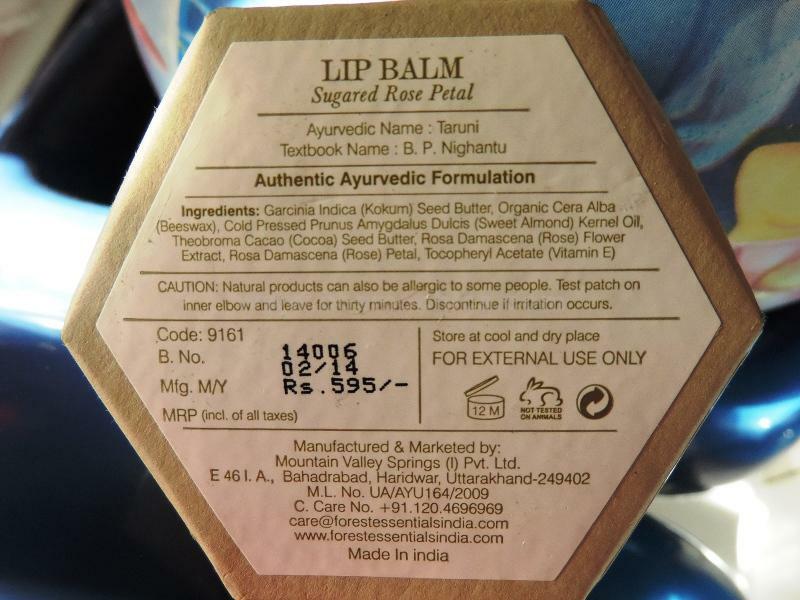 Ingredients- This moisturizing Lip Balm is made with Kokum butter, organic Beeswax, Sweet Almond oil, Cocoa seed butter, rose petals, Rose flower extracts Vitamin E. These natural ingredients work together to deeply nourish, restore elasticity, soothe & moisturize your lips completely. It works to soften chapped lips & leaves them soft & glossy. How to Use– take a small amount of lip balm & apply twice a day or as you need depending on your lip’s condition. This Sugared lip balm has a very light texture. Though its slight pink in color, it’s almost transparent in color. It takes care of dry lips but it needs to be reapplied. It’s light so I think those who have super dry lips, needs to reapply.